My husband and I recently bought a used 2000 Jayco motorhome. After buying it, we discovered the grey water tank does not seem to drain properly. We immediately contacted the RV service shop that had inspected the unit before we purchased it. They flushed it several times. We took it out for the first time this weekend, used it, and flushed it several times hoping to get rid of anything that may still be blocking the pipe and/or the valve. It seems to come out strong when you first open the valve, but then slows to a trickle, even though the gauge shows it being 2/3 to 1/3 full. Also, the valve seems to leak, so that when you pull the drain cap off, liquid spills out immediately before you can attach the hose. We thought it was just grey water, but when we emptied it today, blue liquid came out, indicating that the black water valve was leaking, too. Also, the gauge for the fresh water tank usually reads empty, even when we have filled it. We have shown this to the RV shop that said the unit worked perfectly. Do you have any advice as to how to proceed with these problems? Janet, welcome to the joys of holding tank-itis. 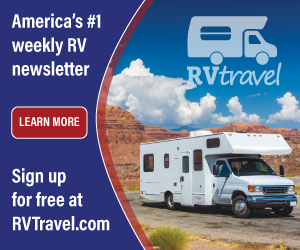 All RVers, at some point during their travels, have experienced much the same dilemmas; either the monitor panel reads inaccurately and/or the termination valves leak - usually all attributable to a lack of maintenance, in your case, by the previous owner. The RV waste management system, much like LP appliances, the generator, or any other component with moving parts, must be serviced periodically. Of course, there are plenty of examples of mis-engineering out there also. You just may be suffering from a combination of ills. It is doubtful the gray water holding tank is plugged or blocked since the contents are liquid. The fact that the monitor panel still indicates some level of waste water is usually indicative of soiled/contaminated probes inside the tank. More common with the black water tank, it can and does happen with the liquid waste water also. Cooking oils, soaps, shampoos and other gunk can actually make an electrical connection of sorts and short across the probes causing an erratic reading. Check out my review of the Horst Miracle Probes here. The addition of these replacement probes will likely eliminate the inaccuracies of the monitor panel. Also, closer inspection will be necessary to verify the proper drain slope from the outlet fitting at that tank all the way to the termination point where you connect the sewer hose. Obviously water cannot flow uphill, so be sure you have plenty of drop for the entire distance. It will be necessary to remove the termination valves to replace the seals anyway, so carefully rinse and drain as much as you possibly can from each tank. Flush both tanks with fresh water as completely as possible beforehand. Now might be a good time to upgrade your manually operated termination valves to electric gate valves such as those produced by Drainmaster. Uneven pulling on the slide valve by hand may have damaged the adapters on either side of each valve. Even if you don't upgrade to the Drainmaster, be sure the adapter fittings on each side of both valves line up properly and that the slide mechanism fully opens and closes. Any binding of the fittings and/or the valve and they might not close all the way. Lube the seals with Dow 111 grease and carefully tighten the four mounting screws in an even manner. Do not over-tighten. This will indeed warp the adapter fittings. Run the slide open and closed a few times to be sure they are operating properly. If there indeed is some type of blockage in the drain piping from the gray water holding tank, it will be revealed as you disassemble the puzzle of all the ABS fittings and the valve. 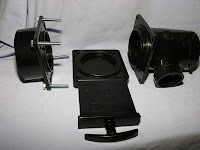 Obviously, clean or replace any blocked or damaged fitting or pipe.